One Of The Most Famous Ancient Cities! 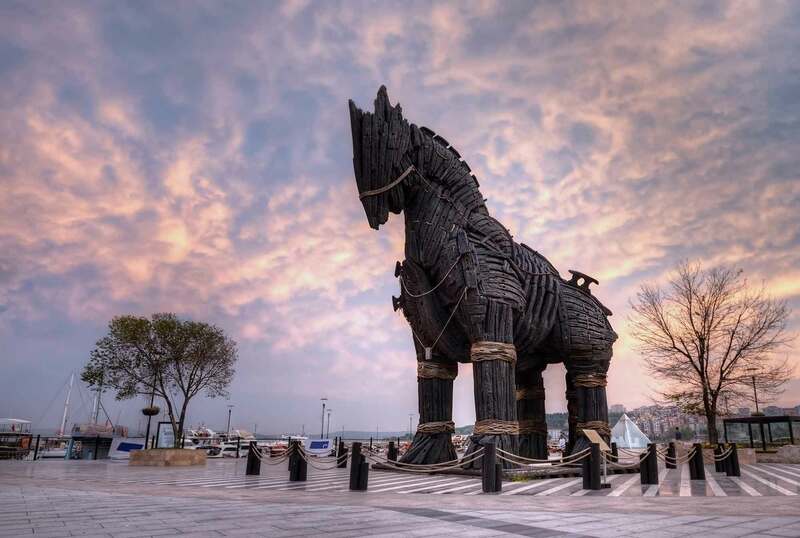 Ephesus Private Tours – Gentle Aegean breezes blow over the sapphire gulfs and ruffle the silver green leaves of the olive trees along this coast, which witnessed the dawn of Western civilization. The Aegean coast of Turkey is rich with unique natural beauties and also has a deep history. 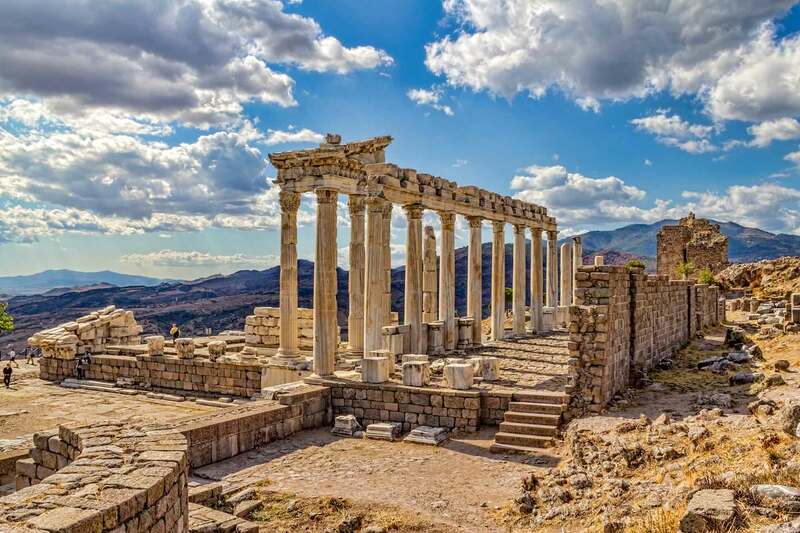 Ancient cities such as Izmir (Smyrna), Ephesus, Miletos, Dydima, Priene, Sardes, Pergamum, Assos, Troy, Bodrum, Marmaris were very important during the ancient Greek and Roman time. Either to spend couple of days in the area or just one day shore excursion for cruise ship passengers we may arrange the best tailor made itineraries for you. 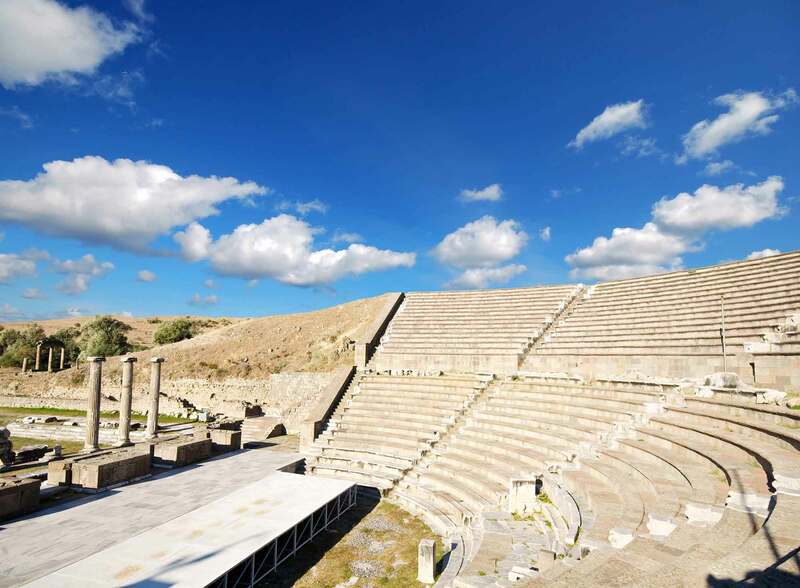 Our Ephesus Private Tours include the archeological site of Ephesus (the Grand Theater, the Library of Celsus, the Temple of Hadrian, the Scholastic Baths, the Odeon, the Lower Agora, and the State Agora etc. ), its museum, the Terrace Houses, the House of Virgin Mary, the Basilica of St. John, the quaint village of Sirince and the shopping area depending on time. The entire list of sites can be visited during one full day tour. We may also arrange alternative itineraries for guests who have already visited Ephesus. The alternative itinerary could cover either the beautiful ancient cities of Miletos, Dydima and Priene or Izmir & Sardes. The Jewish heritage tour is also another alternative as Izmir is one of the most important cities for the past and present Jewish life in Turkey. Sardes covers 1700 years old synagogue ruins. Below you may find information regarding our Ephesus Private Tours and other ancients sites that are in the region and worth visiting. 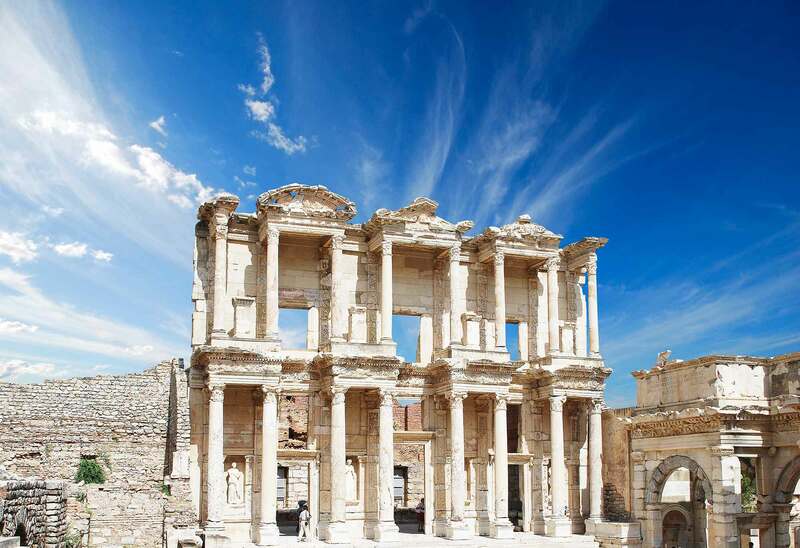 Ephesus Private Tours – Few cities can claim that their names are so closely linked with mankind’s intellectual advancement as these cities of western Anatolia. For it was here that thinking was first freed from superstition, that the foundations of experimental science were laid, and that “man became the measure of all things”. St. Paul asked: “Is there a greater city?”. Along Ephesus’ “Arcadian Way”, Marcus Antonius and Cleopatra once rode in procession; in the great theater, St. Paul preached against the Ephesian’s goddess Artemis; and in a little house outside the city, which can still be seen, the Virgin Mary spent her last days. This history of the city of Ephesus goes back to the 7th century BC. It was one of the most important cities of the Lydia Kingdom. Persians sacked the city in the 5th century BC. In 333BC Alexander the Great conquered the city. In 133BC the Republic of Rome sacked the city and it remained one of the largest and most important cities of the Roman Empire. 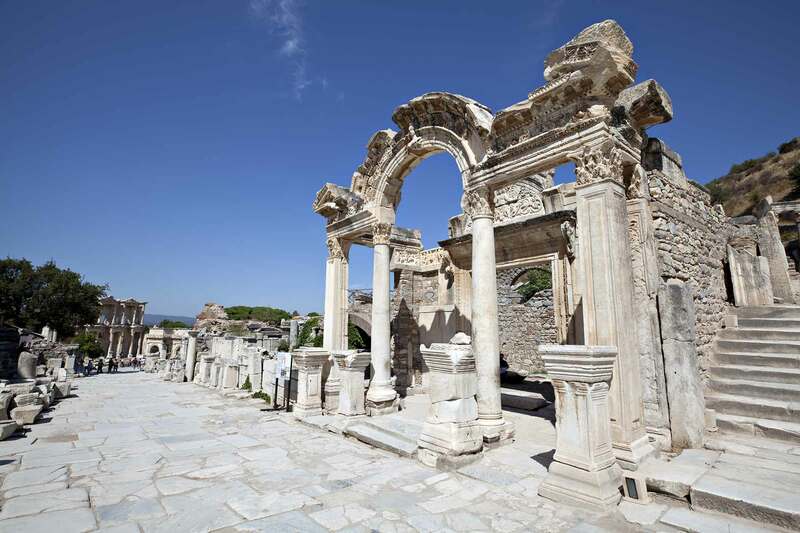 Ephesus is known to have remaining of the Artemis Temple which used to be one of the 7 Wonders of the World. Celsus Library, Hadrian Temple, the Grand Theater, Terrace Houses are the most important parts of the city. The city has a great importance in History of Christianity and St. Paul wrote a letter to the Ephesians. Also, 3 important Councils of Ephesus has shaped todays Christianity. Virgin Mary’s House is just 7 km away from the city and St. John’s Basilica is in the northern part of the city. During the Ephesus Private Tours you will not only experience the natural and historical beauties of the ancient city but also do some shopping and have lunch at a local restaurant. Here stands Homer’s Troy (Truva), one of the most evocative sites of antiquity, recalling the epic struggle of the Iliad. Of the settlement mound’s nine levels, going back to the 3rd millennium. The second is presumed to be Homer’s city (Truva). With the desire and dream to find the ancient legendary city, Heinrich Schliemann started his excavation in 1871, which was made his dream come true. Although he only found a small part of the excavation, he was the pioneer of today’s Troy. The ancient city has nine different archaeological layers and 11 different cultures. The first settlement layer of the city goes back to 3000BC. It is believed that the famous war that was mentioned in Homeros’ Illiad happened during the second settlement of the city. Archaeologist Heinrich Schliemann found a treasury that is believed to be the Treasury of Priamos. The ancient city is located in the North-Western part of Turkey, in the city Canakkale covering the Dardanelles and Gallipoli. 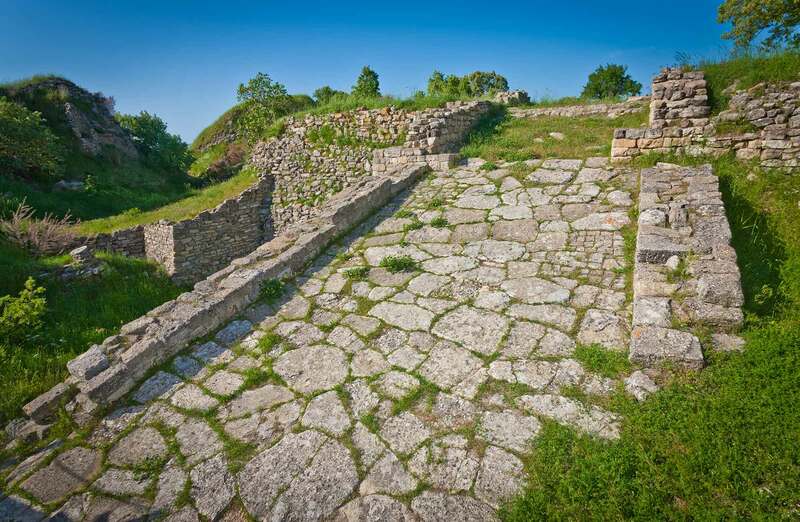 For further information about private tours of Troy please do not hesitate to contact us. We would be more than happy to assist you with any requests. To the south the ruins of the great city of Pergamon (Bergama), a center of learning and the arts, which possessed one of the greatest libraries of antiquity, containing 200,000 books. Not far from the city’s Acropolis are the ruins of the Asclepeion, one of the foremost medical centers of classical times. Contrasting with the tranquillity of these ancient sites is the gaiety of the seaside resorts. This great city is waiting for her visitors to offer her historical intellectual importance. Pergamon is known to have a history of 2300 years. After the conquest of Alexander the Great the city became one of the most important cities of the Hellenistic era. It became part of Rome in 133BC and was the capital of the Asia minor that was controlled by the Romans. The ancient city has important parts to visit: Traianus Temple, Athena Nicoforos Temple, Library, Zeus Temple, the Theater, Dionysos Temple, Hera Temple, Demeter Temple, the Gymnasion, Agora and Asclepeion. For any further information about private tours in Pergamon please do not hesitate to contact us. We would be glad to assist you with any requests. 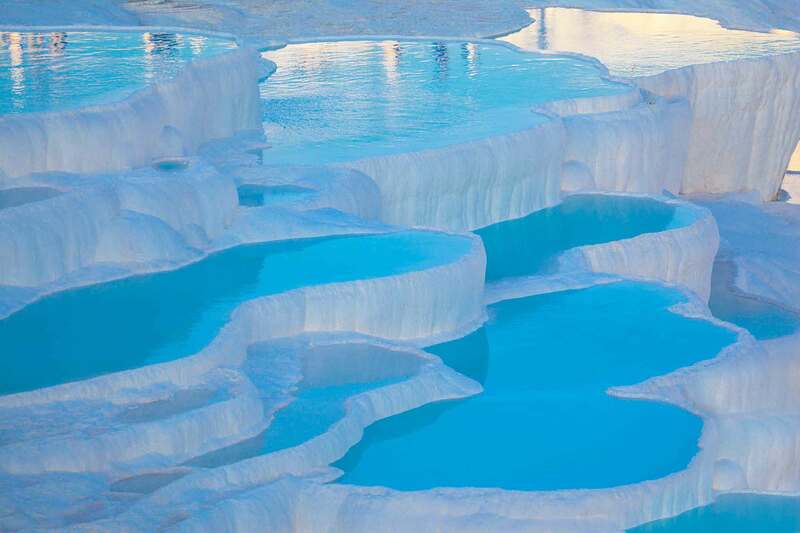 Pamukkale, is the combination of 2 Turkish words: Pamuk (cotton) and Kale (castle). This area is famously rich with its travertines. Thermal spring waters, laden with calcium carbonate running off the plateau’s edge, have formed this sparkling white petrified cascade of basins ringed by stalagtites. 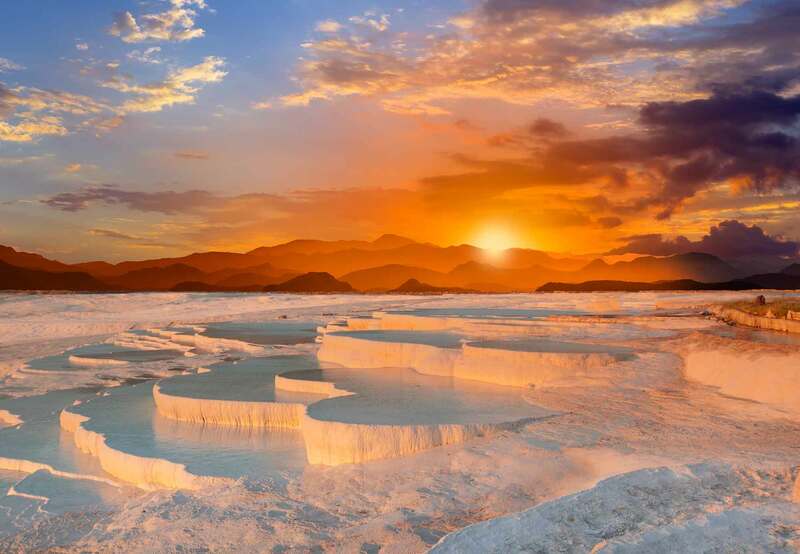 With its natural beauty Pamukkale is an great example of what nature could give us to amaze. Next to Pamukkale, Hierapolis was another important Roman city. The thermal waters have been used since Roman times for their therapeutic powers, and behind the waterfall lie the ruins of the Roman city of Hierapolis. Hierapolis is also an important Biblical site and is known to provide the “not hot; not cold water” to Laodicea, which is mentioned in the Book of Revelation in Bible. There is many more sites that can be visited besides the Ephesus Private Tours. The ones on this page are some of them. This region is rich with natural and historical beauties and has wonderful beaches and resorts as well. A good combination with private tours and leisure times would be a memorable experience. Please contact our agency for further information if you are staying a couple of days in the region. Please do not hesitate to contact us for any questions about Ephesus Private Tours, hotel and itinerary recommendations. We would be more than pleased to assist you. Let us make your time in Ephesus a memorable one! Eskinazi Tourism and Trading Ltd. Co. is a travel agency (TURSAB license number A-6996) specialized exclusively on Private Tours in Istanbul, Ephesus and Cappadocia. We aim to turn your stay in our beautiful city into a happy memory.